I have been so bad at writing this blog recently. On the plus side, I’ve been so good at writing the mysterious new book I mentioned in my last, long ago post and which now a)has a name, and b)is now finished bar the final edits. More news on Checks and Balances in a few days time. In the meantime, mostly to reassure any regular readers that I haven’t either died or had my internet connection cut, here’s a review of my last read. Adelina Amouteru is a survivor of the blood fever. A decade ago, the deadly illness swept through her nation. Most of the infected perished, while many of the children who survived were left with strange markings. Adelina’s black hair turned silver, her lashes went pale, and now she has only a jagged scar where her left eye once was. Her cruel father believes she is a malfetto, an abomination, ruining their family’s good name and standing in the way of their fortune. But some of the fever’s survivors are rumored to possess more than just scars-they are believed to have mysterious and powerful gifts, and though their identities remain secret, they have come to be called the Young Elites. 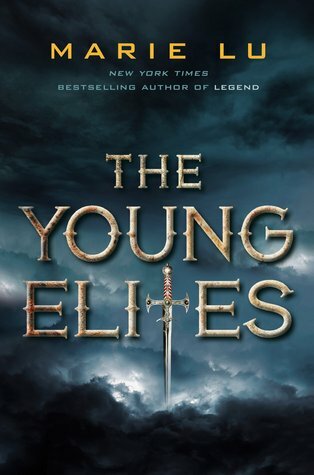 No one had given that me description of the Young Elites, but for the first 80% of the book, for better or worse, that’s what kept churning through my mind. In this Renaissance Italy-esque world, a strange disease killed every adult that caught it, marked every survivor, and gave a selected few strange powers linked to elements and emotions. Our “heroine” (I’ll get to those quotation marks in a moment) Adeline knows she was marked, but doesn’t discover she also has particularly special (but dark) powers until the opening of the book, years after the fever. She joins the titular Young Elites, a group of similarly gifted youths, and along with them, plots to overthrow the Queen and put the Crown Prince on the throne. Said Crown Prince leads the Young Elites, controls fire, is super hot, brooding and charming, and is the perfect mixture of a slightly more chilled out Darkling and a slightly edgier Ezio (and is even called Enzo). Apologies to anyone who doesn’t get either of those references, but basically, if he feels a little cliched, he’s also basically everything you want in a romantic hero. We also have Teren, the psychotic, sadistic and obsessive leader of the Inquisition, tasked with wiping out the Young Elites, despite secretly having powers himself. He’s also super hot and super intense, but miraculously, somehow manages to avoid becoming one side of a love triangle. He starts out as the villain and remains the villain despite having nice eyes. Whether he’ll manage to keep this feat up in subsequent volumes is anyone’s guess! For that first 80% of the book, I really enjoyed it as a fun but predictable read. Everything was well done, but nothing felt really new or unique and nothing that happened really surprised me. Now, unlike some people who get up in arms about it, I don’t really mind books not being original – after all, no novel’s been truly original in centuries. Give me “good” over “different” any day. On the other hand, I never felt it ever quite reached the heights of the stories it was clearly inspired by. Halfway through, I’d almost have put money on where I thought the plot was going to go, so it was a pleasant surprise when, towards the end, there’s a major plot development that sends things off in a different direction and turns this into quite a different sort of novel. This turn of events genuinely shocked me and made my take far more of an interest in the book. It also made some of the comparisons feel a little less fair. It’s hard to explain without giving huge spoilers, but as it’s basically the USP of the series, I think I can get away with saying that the take home message seems to be that the “heroine” of this novel is basically going to be the villain of further installments in the series – and not even through the influence of a man! I didn’t actually see much evidence of real villainy here, and I really wish the author had a)moved things in this direction earlier, and b) ramped them up a bit, and I hope she really goes all out in the sequel. But there’s nothing I love more than a good anti-heroine or even villain protagonist, so I’m excited to see where this goes. It’s worth a read if you like the sources I’ve mentioned (and according to other people, also X Men, which I know nothing about), but if you ever feel it’s too much of a rip-off, keep plowing on, and hopefully the ending will change your mind. This book didn’t quite hit the heights of greatness, but I did enjoy it, and it’s left me really looking forward to the next installment now the world is set up and the unique factors are coming out of the inspirations.